As we surrender the mind and body to stillness in shavasana at the end of asana practice, we also start the journey of returning to our daily lives. For many people dealing with depression, this transition might also mean re-donning the mask that protects them from the outside world. A yoga class, after all, can be a haven from the requirement to contribute to life—a place where there is no need to communicate, where our actions and reactions are not observed and interpreted. As we surrender the mind and body to stillness in shavasana at the end of asana practice, we also start the journey of returning to our daily lives. 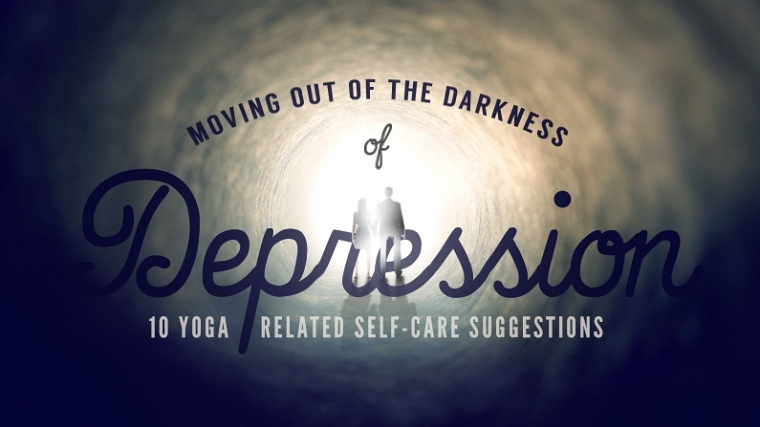 In the midst of severe depression, a sufferer may not have the will or the energy to find their way onto their yoga mat, but, at other times, yoga can contribute to helping people with depression return to wellness, and has also been shown to aid in prevention. We’ve all heard about yoga’s stress-relieving powers—how it can help ease the symptoms and heal the damage that stress inflicts. But despite the positive effects that yoga has been shown to have for many people affected by depression, these benefits don't receive nearly as much attention. Maybe it’s because being "stressed" is a label that many of us wear with pride. How often do we hear our friends and colleagues claim that they are so busy that they feel completely stressed out? In a society where work and other demands leave little time for reflection, and many people suffer from lack of sleep, being "stressed" is the price we are prepared to pay. Stress is seen as synonymous with twenty-first century living. If you’re not stressed, you’re not successful! Depression is different. Sufferers often do not see their condition as something to share, or simply as the result of a modern life. They may feel alone and out of sync with the rest of the world. And they may be unlikely to have the energy or motivation to reach out for the help that they need. Feeling “down” and depressed is part of the rainbow of emotions—loss, illness, misfortune, and other issues affect us all, and it would be unnatural not to feel depressed at some point during our lifetimes. But depression that lingers, or starts to eat uncontrollably into the mind and body, is different and needs to be recognized and given attention. Classic symptoms of depression include feelings of detachment, loneliness, fear, anger, worry, and more. These emotions can make it difficult to cope with even the simplest things in life. This can lead to further separation from life and eventually more loss—coworkers, family, and friends may feel rejected and unable to help. It is also common for people with depression to develop coping mechanisms so that they are able to function at work, home, and in the classroom; tears can be hidden, anger suppressed, and loneliness absorbed, which may lead to alienation and increased loneliness. Yoga can help ease these feelings and bring sufferers back to a healthier state of mind. It is important for those suffering from depression to seek medical diagnosis and support, but on the road to recovery and long-term wellness, yoga can provide a nurturing space and a route to a fulfilling life and belief in the future. Mild depression has some impact on daily life. Moderate depression has a more significant impact on daily life. Severe depression makes it almost impossible to get through daily life—with a few people displaying psychotic symptoms. There are also specific times and situations when depression is more likely to occur, including: Postpartum depression following the birth of a baby (which differs in severity from the "baby blues") and Seasonal Affective Disorder (SAD) where lack of light—usually during the winter months—can cause feelings of sadness and low energy. Sleep: Although many people with depression report feeling lethargic and unable to get out of bed, they may not be sleeping well. Unable to sleep, the mind may spend hours connecting with fears and anxieties which appear insurmountable in the early hours. And when we’re tired and grumpy from lack of sleep, each day can feel like a trial, and eventually emotional and physical health may start to deteriorate. Although many people with depression report feeling lethargic and unable to get out of bed, they may not be sleeping well. Many yoga students report improvement in the quality of their sleep—even after their first class. There are many causes for insomnia and other sleep disorders, but by learning how to relax, we are able to train the mind and body to let go of some of the anxiety and stress that prevents us from falling asleep. Environment: Seasonal Affective Disorder can often be helped by planning time outdoors and maintaining a connection with the environment. Negative ions from natural light stimulate a connection with nature that is essential for mental and physical health. A daytime yoga practice in natural light increases well-being, energy, and empowerment. Healing Power of Touch: Feeling low, insignificant, and unworthy means that depression can take its toll on relationships. Hugs and physical contact may be desperately needed, but rejected. Yoga encourages an acceptance of the body and celebrates its uniqueness in all its forms. Touch can release emotional and physical tension and stimulate the mind and body. Even a gentle, non-invasive handshake is an offering and acknowledgment of the physical presence. While hands-on assists in yoga class can be a great way to offer students support, teachers should be sensitive to physical (and verbal) adjustment that may be seen as criticism, and always ask permission before offering physical adjustments. Massage: Ayurvedic massage techniques can harmonize the emotions and help heal an aching mind. For generations, ayurvedic specialists have been providing support for people with depression using hands-on massage and traditional oil formulas with the sacred treatment shirodhara, which involves pouring a steady stream of warm oil over the area associated with the ajna chakra (our center of intuition) between the eyebrows. This treatment is deeply relaxing and can help to remove stress, calm the nervous system, and encourage feelings of peace and tranquillity. Choosing food for nutritional value and adding the right supplements may help to lessen and prevent symptoms of depression. Nutrition: Depression can lead to a lack of interest in food or even overeating. And the brain craves high calorific, sweet foods when exhausted. This may mean a dependence on fast food and a gradual depletion in nutrients, the “building blocks” of the brain. There is increasing recognition of the importance of diet as a contributing cause to depression. For example, it’s been shown that sugar consumption can contribute to depression, as well as increased weight. A well-balanced diet that includes fats, minerals, and vitamins in the right proportions for the individual will show long-term benefits. Choosing food for nutritional value and adding the right supplements may help to lessen and prevent symptoms of depression. Philosophy: Sometimes people feel a high degree of guilt and responsibility for their depression. For example, someone might feel that they are experiencing a form of “payback” for past discrepancies and are being punished by their suffering. Yoga philosophy can provide an antidote to these beliefs through acceptance and encouragement to embrace life’s ups and downs. For centuries, yoga philosophy has provided simple guidelines aimed at creating and maintaining physical and emotional balance. When concentration is low, reading major texts may be challenging, but Patanjali’s Yoga Sutra is a great source of inspiration and understanding, and the yamas and niyamas described within offer simple guidance and hope for a fulfilling life. Yoga Classes: The physical asana in a yoga class requires concentration, encouraging the mind to disconnect for an hour or two. This helps the mind “switch off” from some of the worries and preoccupations that feed the depressive state. Add to that the positive physical effects, mental stimulation, group support, and a caring environment and you have a package that can prove to be of great benefit. Support: Yoga can improve self-esteem. Depression can make it difficult to concentrate for long periods, and when attention wanders we may find ourselves connecting with negativity. By keeping asana doable, and working for short periods, it is possible to build trust not only between the teacher and student, but also in our own abilities. Relaxation: Relaxation may cause an eruption of emotions. It is not unusual for feelings and anxieties to come to the surface during deep relaxation. Some find the unleashing of emotions helps them move forward, and this catharsis may give them a sense of freedom from the symptoms of depression. Initially sessions should be short, with plenty of time allowed to transition back into the day. It may also feel more comfortable for some students to practice with eyes open. If time allows, teachers may consider offering the opportunity to discuss the experience at the end of class. It is not unusual for feelings and anxieties to come to the surface during deep relaxation. Meditation: Meditation is a powerful tool and can provide great benefits under suitable supervision. Initially it is best to keep meditation short and positive. Concentration on breathing or simple connections with sound may facilitate an understanding of the subtle connections between the mind and breath. Some people may find uplifting meditations useful, but just as a sunny day can sometimes make someone who is depressed feel more alone, an uplifting meditation could have the same effect. Recent research supports the benefits of yoga in treating mild depression, citing yoga’s emphasis on breathing and stretching, which increases oxygen levels in the body, leading to feelings of physical and mental well-being. Yoga also focuses attention away from the chatter in the mind, encouraging the mind to find calm, and to move away from the negative thoughts that accompany feelings of depression.